Meaningful investment solutions should start with an understanding of clients’ goals. In retirement planning, the main problem faced by individuals is to finance a sufficient and stable stream of replacement income in retirement. EDHEC-Risk Institute is grateful to Merrill Lynch for having supported the research project that has provided the conceptual foundations for the design of the EDHEC-Princeton Retirement Goal-Based Investing Index Series. The Retirement Goal-Based Investing Indices, developed with the Operations Research and Financial Engineering Department at Princeton University in the context of our joint research programme on Investment Solutions for Institutions and Individuals, are an example of these concepts being implemented. They represent asset allocation benchmarks for innovative mass-customised target date solutions for individuals preparing for retirement. Taking the example of an individual who plans to retire in 2038 and targets fixed replacement income for twenty years starting in 2038, it cost $7.98 in December 2018 to acquire $1 per year of income. As of January 2019, the price of the same stream of replacement income has risen to $8.46. Put differently, this person could have purchased $12,531 per year with $100,000 in December 2018, but the same amount of retirement savings in January 2019 can only finance $11,820 per year. The rebalancing rules of the index series stipulate that in every January, each Goal-Based Investing index is rebalanced back to the weights of a deterministic target date fund with the same target date as the index. This rebalancing operation takes place irrespective of market conditions, so January is the only month in the year where the relative weighting of the two constituents does not reflect their respective past performances and is driven solely by the retirement date. For all indices, rebalancing has led to a lower PSP allocation than at the beginning of December 2019. Just as in a standard target date fund, indices with longer horizons are more exposed to the risk of equities falling once more as well as to the chance of equities going back to higher prices. The EDHEC IEIF Monthly Commercial Property Index (France) was developed by IEIF (Institut de l’Epargne Immobilière et Foncière) and EDHEC-Risk Institute, in collaboration with the global competitiveness centre Finance Innovation, under the patronage and with the support of La Française Group. Published since 2009, this index measures the monthly performance of an aggregate portfolio of unlisted funds, without financial leverage, representative of the performance of French commercial property. Highlights: The EDHEC IEIF Monthly Commercial Property Index (France) price index increased by 1.4% in February after an increase by 0.5% in January. The index is up by 1.9% year-to-date and 3.5% on twelve month rolling average. The total return index is up by + 8.1% on twelve month rolling average. Investors need benchmarks to evaluate the performance of hedge fund strategies, but existing hedge fund indices only give them a partial view of each investment style. Since 2003, EDHEC-Risk Institute has been publishing the EDHEC-Risk Alternative Indices, which aggregate and synthesise information from different index providers, so as to provide investors with representative benchmarks. These indices are computed for thirteen investment styles that represent typical hedge fund strategies. The FTSE EDHEC-Risk Efficient Index Series aims to capture equity market returns with an improved risk/reward efficiency compared to cap-weighted indices. The weighting of the portfolio of constituents achieves the highest possible return-to-risk efficiency by maximising the Sharpe ratio. The FTSE EDHEC-Risk Efficient Eurobloc ERAFP SRI Large Cap Custom Index aims to efficiently capture the performance available within an SRI screened universe of large and mid cap stocks in the Eurobloc. While the SRI screen allows addressing non-financial objectives, the efficient weighting scheme seeks to improve return-to-risk efficiency by improving portfolio diversification. While the screen relies on qualitative information on companies' SRI compliance, the weighting method uses robust estimates of a stock’s risk and return as inputs. For further information, please contact FTSE. We collect, clean and analyse the private infrastructure investment data of the project’s data contributors as well as from other sources, and input it into EDHECinfra’s unique database of infrastructure equity and debt investments and cash flows.We also develop data collection and reporting standards that can be used to make data collection more efficient and reporting more transparent. 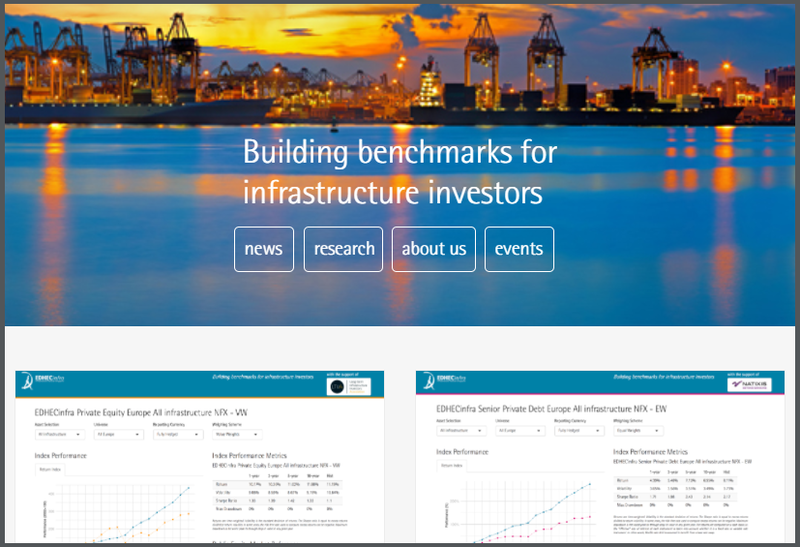 This database already covers 15 years of data and hundreds of investments and, as such, is already the largest dedicated database of infrastructure investment information available. 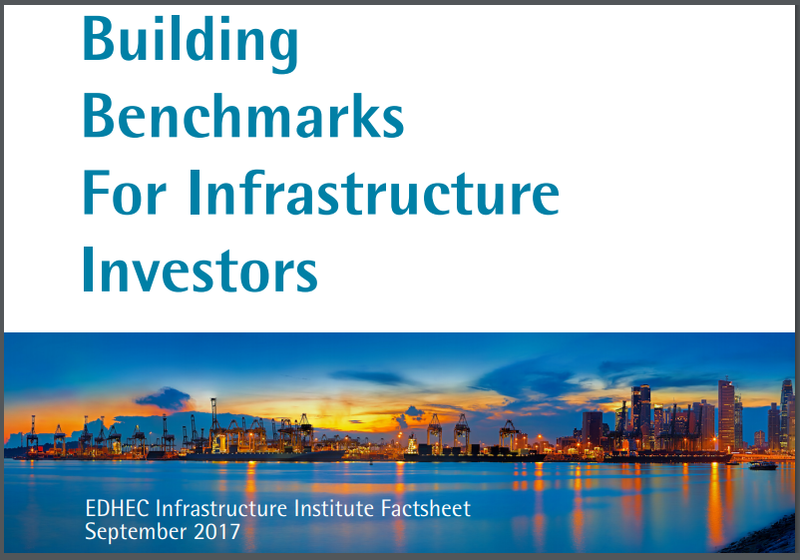 Using this extensive and growing database, we implement and continue to develop the technology developed at EDHEC-Risk Institute to model the cash flow and discount rate dynamics of private infrastructure equity and debt investments and derive a series of risk and performance measures that can actually help answer the questions that matter for investors. Using the performance results from our asset pricing and risk models, we can report the portfolio-level performance of groups of infrastructure equity or debt investments using categorisations (e.g. greenfield vs brownfield) that are most relevant for investors’ investment decisions.